This Deluxe Reading/Topper doll was acquired from an antique shop near where the family vacations. This doll came fully clothed and with her accessories and box. The only thing missing was her party blow out. Her balloon was too desiccated to use. We were so excited to test her that we forgot to photograph everything before opening her up to get her to work when fresh batteries didn't do the trick. 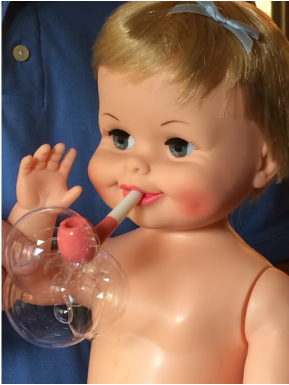 The problem with this doll was a seized up motor. Her lung capacity isn't what it would seem to be from the advertising on the box. She can blow bubbles fairly well but her horn blowing is pretty weak. The internal bellows doesn't have the pushing capacity to inflate regular sized balloons. The bellows is connected to a "T". When the spinning motor expands the bellows, air is drawn into the bellows past a check valve (opening to the right in the photo). 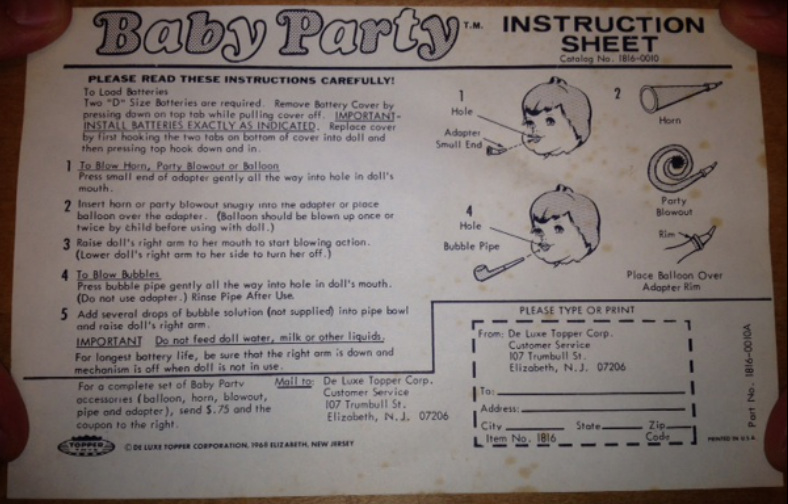 When the motor compresses the bellows, air is forced out the left side of the "T", travels through a tube to the head, and out the mouth to perform all the doll's party functions. 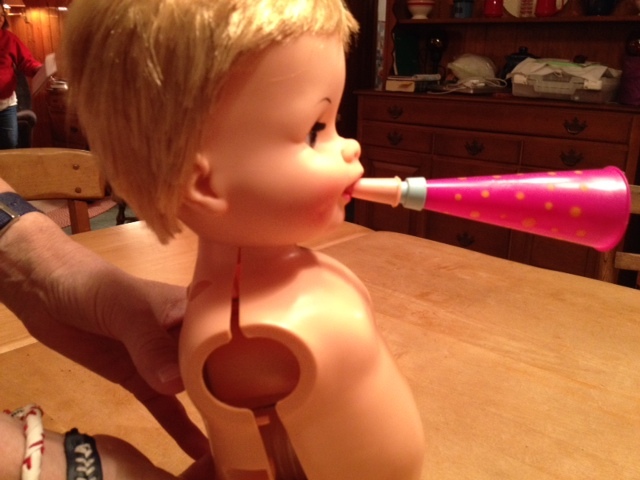 Raising the doll's right arm brings a large staple into contact with a pair of narrowly separated plates forcing them together - closing the circuit and starting the blowing action.